Submitted by lannocc on Sat, 2006-12-09 14:27. Meetings start at around 5PM and have no formal ending time but usually end around 7PM. Submitted by lannocc on Fri, 2015-09-18 10:12. Dan Denson will discuss and demonstrate static routing, simplification with OSPF, and advanced routing with MPLS/VPLS. Submitted by lannocc on Fri, 2014-06-06 03:40. First Open House for MT Radio.Net. We launched in November and utilize Linux for our broadcasting. MT Radio.Net is a community-supported Internet broadcasting platform for Montana. MORE INFO and RSVP (encouraged but not required). Submitted by lannocc on Wed, 2013-06-19 14:31. Come learn how to control your homes lights, locks, thermostat and more using Linux and other open source technologies and inexpensive hardware. Andrew Niemantsverdriet of Rocky Mountain College will cover the most popular technologies used, some history and speculate on the future of home automation. We will also go over other hardware options and costs currently available. Meeting Thursday, 6/20, at 6 PM. We will meet at American Welding & Gas at 1123 3rd Ave N.
Submitted by lannocc on Mon, 2013-05-13 14:49. This month Dan Denson will take the lead showing us many possibilities and great features of the MikroTik line of routers (http://mikrotik.com). He will use an RB1200 serving as "the Internet"/ISP with one port serving DHCP, one for static IP, and another PPPoE so we can illustrate each connectivity type that is common. Then he will create VPN tunnels with PPTP and SSTP, as well as IPSec transport mode with IPIP and GRE tunnels. For routing, he will show both OSPF dynamic routing as well as plain old static routes. We hope to also get a chance to look at some of the other many great features of these routers, such as using port-knocking to obscure open ports and running services. Meeting Thursday, 5/16, at 6 PM. This month we will meet at American Welding & Gas at 320 North 11th St. Park on 3rd Ave between 11th and 12th St. Submitted by lannocc on Tue, 2013-04-16 15:25. For the LUG meeting this month Donnie would like to give us a tour of his building at 2215 6th Ave. There is potential for this location to serve as the primary location for a local maker group. So for our regularly-scheduled meeting time we will tour the location and discuss our options and ideas for getting a maker space going in Billings! This is a great chance for anyone interested in a local place to work on technology projects to come out and share their ideas and needs. Ultimately we believe that the right location and core group of people could serve as a sort of incubator for new business and technology in Billings. Please note we are starting an hour earlier this time. Submitted by lannocc on Wed, 2013-03-20 15:29. We are postponing our March meeting by one week. So we will now meet on Thursday, March 28, 7 PM at Lannocc Technologies. No topic has been set for this meeting yet but some possible discussions are looking at the Steam for Linux client, Plex Media Server, or B.A.T.M.A.N. wireless meshing. Submitted by lannocc on Wed, 2013-03-27 09:09. We'll start off the meeting by showing a Plex Media Server setup and see how well the Plex apps for Roku and Android perform. Might also get a chance to try the beta RasPlex client on a Raspberry Pi. Submitted by lannocc on Tue, 2013-02-19 16:47. Explore the landscape of open-source Linux audio software. From MIDI to multi-track audio mastering, to real-time effects, come see open-source audio production in action and hear the music of Linux! A few of the programs we'd like to look at are: Ardour, Audacity, Hydrogen, RoseGarden, and TiMidity++. We will also explore the Jack audio subsystem and try out different hardware such as a USB MIDI keyboard and DJ controller. Linux on the local TV news! Submitted by lannocc on Thu, 2013-01-17 22:59. Kenneth Wong from KULR-8 stopped by the Billings LUG tonight to interview some of the attendees and learn more about Linux. He did a great job with the material on his Tech Corner segment which aired on the KULR-8 News @ 10 tonight. Thanks to everyone who participated tonight! Submitted by lannocc on Fri, 2012-12-14 14:25. On the LUG night this month (Thu 12/20) we will do a bit of embedded show and tell. A few of us have Raspberry Pi's and Andrew N. of Rocky will show what he's doing with an Arduino clone temperature sensor he's putting together for around $6. I also saw an article a few days ago on using the Pi as an FM transmitter using just software to have the clock oscillate a GPIO pin. I'd like to try it out as the only extra hardware needed is a wire to attach to the pin as an antenna. This all seems to fit with some of the makerspace ideas so it'd make a great segue into that sort of discussion. Figured we could do a joint LUG / MT Programmers / (future) hackerspace meeting this month. Submitted by lannocc on Fri, 2012-12-21 00:41. Thank you to Andrew, Dan, and Richard who showed off some of their projects and to everyone who joined us. Here's the page to download the Raspberry Pi FM transmitter code. Sure is a neat hack for 314 lines of C and a piece of wire! Submitted by lannocc on Tue, 2012-11-13 14:13. This month Dan D. will bring a Ubiquity airCam IP camera. We will have a look at their airVision NVR Server package which is their web-based UI that runs on Linux as well as see how it works with ZoneMinder, etc. And I will try out a first-time installation of Chromium OS, a Linux-based operating system designed by Google to work exclusively with web applications. Come to the meeting on Thursday, November 15 to claim one for yourself! If there is enough interest we will hold a contest/drawing for the books. Submitted by lannocc on Fri, 2012-11-02 15:46. Submitted by lannocc on Mon, 2012-10-08 15:39. Join the BillingsLUG as we demonstrate features and compare the differences between two common Linux distributions and why the Open Source model is so beneficial to computer users and developers alike. Debian GNU/Linux began in 1993 as an alternative to the buggy Softlanding Linux System of that time. It is known for relatively strict adherence to the philosophies of Unix and free software and focuses on stability and security. Ubuntu is one of many distributions based upon Debian and is the most popular Linux distribution on desktop/laptop personal computers. Beginning as a fork of Debian in 2004, Ubuntu is known to provide a more "user-friendly" operating system and offers additional cutting-edge software not found in stable Debian. Ubuntu is an excellent example of how the open source model facilitates the legal adoption and changes of existing software to fit new requirements. This month we would like to welcome you to show up early for a free viewing of Revolution OS on the projector before the meeting, beginning at 6:15 PM. Revolution OS is a 2001 documentary film that traces the twenty-year history of GNU, Linux, open source, and the free software movement. Submitted by lannocc on Mon, 2012-09-10 13:08. 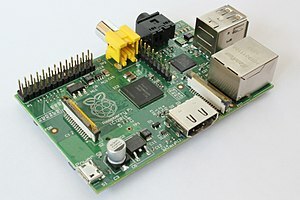 Join us this month for a demonstration of the amazing Raspberry Pi! This small board computer runs on USB power and loads from an SD card. It provides composite and HDMI (high definition) video output, audio, and USB ports. The $35 model includes 256MB RAM and a 100Mbit ethernet port. See the Raspberry Pi site for more information on the hardware. We will be showing what it's like to run different Linux distros on this hardware and will demonstrate it running one or more retro game system emulators (NES, Master System, etc.). Submitted by lannocc on Mon, 2012-09-10 12:54. Now follow events and discussions about the Billings Linux Users Group with the Billings Computer Club page on Facebook. Submitted by lannocc on Wed, 2012-02-15 17:56. February's BillingsLUG meeting is tomorrow (Thursday) at 7PM. We are meeting at the new shop! For this meeting we plan to update our MAME arcade machine with Linux. Will probably use Mythbuntu distro and set up some emulators! Submitted by lannocc on Thu, 2011-12-15 00:34. We'd like to establish a WDS-based mesh network with RouterBoard 751s. We'll also flash a PicoStation with Unify. Anyone interested in wireless and Linux is welcome! Submitted by Krycom on Sat, 2011-11-19 20:53. What's the age group showing up for these meetings? Submitted by lannocc on Thu, 2011-12-01 19:12. Sorry to reply so late. Here at the Billings LUG we have about 4 regular members show up to nearly every meeting, ages ranging about 30-40. Submitted by lannocc on Wed, 2011-11-16 15:46. This month will be a mobile meeting! Feel free to join us at Yellowstone Systems as we pile into Brian's minivan and drive around Billings locating wireless access points. We will be doing a survey of secure vs. open access points in the 2.4GHz and possibly 5GHz bands. We'll try to make use of the Backtrack Linux distribution in our search. Submitted by lannocc on Fri, 2011-11-18 04:47. Last night's wardriving went quite well. It didn't take long to install the Backtrack 5 R1 distro (32-bit GNOME edition) on a laptop and get Kismet running with a USB GPS device and USB radio listening on 2.4 and 5GHz channels, thanks to the easy guide at http://blog.securityactive.co.uk/2009/07/17/wardriving-with-kismet-newcore-and-backtrack-4. Submitted by Worzie on Fri, 2011-11-18 09:15. Submitted by lannocc on Fri, 2011-11-18 17:29. Submitted by lannocc on Wed, 2011-10-19 14:15. Some of us will be available tomorrow at Yellowstone Systems for our monthly LUG meeting. There is lots to work on here at the shop but the initial focus will be setting up replication in OpenLDAP. We have one remote LDAP server handling authentication for our subnet and would like it replicated locally. It looks fairly straightforward but I have not personally done it yet so there may be a little trial and error involved. This might not take the full time slot and additional topic ideas are of course welcomed! Submitted by lannocc on Fri, 2011-08-19 11:00. Thanks to Dan D. for hosting our August meeting. We had a total of 5 people in attendance. This meeting had no specific topic but instead was an open forum where we discussed possible topics and direction for future meetings and ideas to increase attendance. What follows below are ideas we came up with and is just a start. Please feel free to add to these lists. Submitted by syadnom on Fri, 2011-08-19 11:37. I would add zoneminder to the topics list. Submitted by lannocc on Sat, 2011-08-20 22:55. That's another good topic. Yeah, my site is down until Monday probably... but there is no new information there. Submitted by lannocc on Thu, 2011-07-21 17:30. I'm at my operations office tonight working on reformatting my laptop to set up virtualization for Gentoo Linux and Windows Vista. Right now a full backup is nearing completion and then I will move forward with virtualization software install. My Intel CPU supports hardware virtualization (`grep vmx /proc/cpuinfo`) so I will be looking at software to utilize that. I will be here most of the evening working and chatting about Linux. Anyone is welcome to drop by! back lot and enter through door on east side. I'll put a sign up. Submitted by lannocc on Tue, 2011-07-26 06:10. Just wanted to post an update on how things went. During the meeting we had to wait for a bit while a full backup (ultimately unnecessary) completed and then I emerged the app-emulation/virtualbox-bin package from Portage on my Dell laptop running Gentoo Linux. Merge went quickly (binary package) and we created a new dynamic disk image for Windows, set to a maximum of 20GB. I inserted my Dell OEM Windows Vista Ultimate 32-bit CD that shipped with the laptop and ran through the Windows install within VirtualBox with absolutely no problems. Everything just worked! I spent the next few days slowly getting Windows updates and service packs installed through Windows Update. This was all necessary so I could move away from my Windows XP VMWare image in order to test sites against Internet Explorer 9. Thanks to everyone who showed up. I look forward to next month's meeting! Submitted by lannocc on Sun, 2011-06-12 23:57. This week I can show off a working shell interpreter I'm writing for a web-based (Java Tomcat) XML distribution I am hacking together. It's Linux-related in that my shell is following Bash as I implement new features and I'm laying out files and processes in FHS fashion, and it makes use of a growing number of GPL-licensed libraries. Submitted by lannocc on Thu, 2011-06-16 14:45. I'll be at my operations office tonight at 7:30 for anyone who wants to show up and talk about Linux stuff. I can show off a simple shell parser I have started for a sort of web-based "distribution", and I have started a Mercurial code repository to do something with Gentoo for BillingsLUG. It's another informal meeting tonight and anyone is welcome. 7:30 PM through 8:30 PM I'll be there. Submitted by syadnom on Sun, 2011-05-22 07:43. Please reply with what days you would be interested and/or able to attend. I do SQL (MS-SQL, postgresql), bash scripts, Cisco (routers, vpns), asterisk w/ freepbx, pfsense, Linux and Windows administration, Active Directory, etc etc. There are a few facilities available such as my conference room downtown. I am also interested in setting up a computer clinic at a local school or something close like Shepard or Park City. Usually a good place to help people out and a nice way to hand out business cards for those that are self employed. I would suspect that we could partner with another group like Kiwanis who are already pretty good at setting these things up. Sam Thomas at Integra who is a member of Kiwanis would probably be on-board and excited about the prospect. Submitted by lannocc on Wed, 2011-06-08 15:09. Dan, were you still looking to try to get together on a day other than the regular meeting date? I am available tomorrow, June 9 if you still want hang out and toss ideas around. Due to the silence it sounds like I could be the only other person there. I started a Mercurial repository for some sort of branded Gentoo distro for the BillingsLUG and I would be happy to host additional repositories for other group projects as well. I don't have a LiveCD ready yet but I may still be on track to have that by the regular meeting time next week. Submitted by syadnom on Thu, 2011-06-09 06:16. I don't know. Anyone else interested? Submitted by lannocc on Thu, 2011-06-09 10:17. I take that to mean no then, and I probably won't get to check emails again until late this evening so I'm making other plans. So for the regular time next week we can still meet at my ops office again and I don't care if I'm the only one who shows up, I have a few nifty things to work on or talk about for those who come around. Submitted by syadnom on Thu, 2011-06-09 10:33. Agreed. lets try to get a few people onboard for next week. Submitted by lannocc on Sun, 2011-05-22 16:31. Well, for June most of those days would work for me except possibly the 23rd when I may be out of town. Dan has a facility as do I and I'm sure others as well so it'd be great if try to rotate where we meet. I like the idea of doing something with Kiwanis since I have been thinking of personally getting involved with that organization anyways. If we want to do the PC clinic thing we should think about planning over a couple of our next meetings. I know a couple years ago we started planning some sort of install-fest yet our momentum fizzled out and it never happened. I really like the idea of seeing some of the major distros installed again, looking at how they differ, and trying our hands at remixing a few of them as a group effort for some locally-branded distributions. I have a Gentoo starter, Scott has a MontanaLinux Fedora remix and he mentions another Debian-based distro from the HelenaLUG. I'm of the opinion that the more we get our hands on and play with the better; this is just for fun. Submitted by lannocc on Thu, 2011-05-19 04:33.
available for our "regular" scheduled time tonight. back and enter through door on east side. I'll put a sign up. Submitted by lannocc on Sun, 2011-05-22 16:17. Thank you to everyone who came out on Thursday! I am looking forward to our future meetings. Submitted by syadnom on Thu, 2011-05-19 06:22. Shawn, the last few LUGS have had some pretty poor turnout. I would definitely come on a regular basis if we could get 5 or more people and have a showing. Also, my shop is available just about any time. Submitted by syadnom on Thu, 2011-02-03 08:37. My facility is available for a LUG on the 17th. If anyone wants to have one please let me know. The last two have basically fizzled. Submitted by syadnom on Thu, 2011-01-20 13:44. The Billings LUG is tonight! Thursday Jan 20th. Come on by, the address is 1123 3rd ave North. Submitted by Worzie on Mon, 2010-09-20 15:53.
make up for the lack of meetings the last few months. Office, 1123 3rd Ave. N.
email to make suggestions. Dinner ideas? Submitted by syadnom on Wed, 2010-09-22 16:20. The official LUG (*UG) will be Thursday the 23rd officially starting at 7pm. You may show up as early as 6pm if you like, I will be present. Please bring your own drinks, unfortunately no alcohol on the premises. Also, you are welcome to bring a laptop as we will configure a hub and spoke VPN with 3 pfsense installs. Tonight I will be finalizing some setup for the lab on Thursday as well as chatting with whomever shows up. I also have a XenServer install available and high speed internet if you would like to check out some commercial virtualization. The address is 1123 3rd Avenue North. I can be reached at 4066907257 if you cant find the place. There is a 7' metal sign at ground level that says 'AWG' near the front door. Submitted by beazer on Wed, 2010-06-16 17:12. For tomorrow's meeting, I will be demonstrating how to modify a pre-built virtual appliance into a multimedia server for TiVo DVRs. This demo will highlight the TurnKey Linux and pyTivo projects. Our gracious venue host for this month is Brian K. of Yellowstone Systems (www.yellowstonesystems.com). The meeting location is 1327 Central Ave at 7pm. I'll be bringing cans of San Pellegrino Limonata and Aranciata for your imbibing pleasure. Submitted by Donnie on Wed, 2010-05-19 09:35. Dan (syadnom on #ubuntu-montana) will be showing FreePBX 2 as well as the current developer release of FreePBX 3. There will also be Astra IP phone handsets to use as well, making for a great hands on experience for everyone. The talk will cover the function, configuration and auto deployment of the Astra phones using FreePBX, the new FreePBX 3 interface and what the new and upcoming FreeSWITCH has in store for us. April 2010 Meeting -- New venue! Submitted by lannocc on Tue, 2010-04-13 13:19. At this month's meeting (Thursday 4/15) I will be showing how to use the dvdauthor tools along with GIMP and a little Cinelerra to create animated DVD menus. The entrance is on 3rd Ave. As usual the meeting starts at 7pm. Submitted by frego on Thu, 2010-03-18 12:37. Brian will be presenting data recovery options using freely available Linux tools such as ddrescue and gparted in conjuntion with live CD's such as Ubuntu Desktop and Clonezilla. Hope to see you all there! Submitted by Donnie on Thu, 2010-02-18 11:20. Tonight's agenda will include a tour of Brian's new business, Linux news and general Linux User Group discussion. If any of these topic interest you, please make your vote at tonight's meeting. We are also looking for volunteers to present a topic. If you have something you wish to share, please let us know.